Once the configuration has been set up, the examples in this document should be executable, as long as the Java SDK for ThreatConnect is part of the classpath. See the following examples for a typical start-up script. The Java SDK will need to be configured with an Access ID and Secret Key. When a no-arg Configuration constructor is called, the SDK searches system properties for the “threatconnect.api.config” property. If you are working with the ThreatConnect sandbox, the connection.tcApiUrl should be: https://sandbox.threatconnect.com/api. The Java SDK for ThreatConnect was designed with a focus on abstracting the API REST calls while enabling the developer to use an enterprise-level programming language. The abstraction layer is relatively “thin” because it coincides directly with all of the REST API calls. In fact, the entities themselves were ported directly from the ThreatConnect API to enable consistent communication between the Java SDK and the REST API. The Java library was designed with common programming design patterns. You’ll notice the “Adapter” pattern used to manage the interaction with the API connection and REST calls. The Java SDK depends on the Apache HTTP components open-source library to handle these calls. Because instantiating an Adapter requires a low-level RequestExecutor, a “Factory” design pattern was utilized to expose reading/writing functionality in a simplified way. Java generics are used to type many of the Adapters in an effort to reuse code, as most readers share functional resources. Below is a diagram that will help illustrate common interactions between different classes (Note: Names are conceptual to illustrate interaction. Actual class names and methods will be discussed later in this document) . All interactions with the Java SDK will follow this programmatic idiom. To facilitate interaction with the full set of Java SDK readers and writers, the use of ReaderAdapterFactory and WriterAdapterFactory, respectively, is highly recommended. Once retrieved, the adversary objects will be printed to the console. To write the first program using the Java SDK for the ThreatConnect API, an Adversary reader that pulls all adversaries belonging to the “System” Organization must be created. Apps must be packaged and deployed into ThreatConnect’s application runtime environment. ThreatConnect Java integrations require Oracle JRE 7 or later. OpenJRE is not supported. These libraries are automatically included in the classpath of every Java app. There is no need to include these libraries in the installation zip file. There is also no need to include these libraries in the configuration variable named java.classpath. Apps use a deployment configuration file to define variables and execution environment. You can read more about the deployment configuration file here. The application runtime environment passes standard parameters to all jobs as part of its standard sandbox container. There should be no assumptions made on the naming or existence of paths passed in these variables outside of the lifetime of the job execution. Because all job executions are run in a sandboxed environment, app developers should never hard-code ThreatConnect Parameters. tc_log_path Log path for the specific instance of the job execution. tc_tmp_path Temporary storage path for the specific instance of thejob execution. tc_out_path Output path for the specific instance of the job execution. tc_api_path Path to the ThreatConnect API server. Job executions can use a special file called results.tc to write results as a mechanism for updating parameters for subsequent runs. A use case for this feature is an app that needs to know the last time it completed successfully in order to process data since that completion. The parameter definitions are quite flexible, with the only restriction being that the parameters written to the results.tc file must exist in the configuration file in order to be persisted. Assuming there is a property with the same name in configuration, the job executor will update the new property value in the system for the next run. The property will only be stored if the job execution is successful. This file should be written to the tc_out_path passed as one of the standard ThreatConnect parameters. When System.exit() is not called by the app, an exit code of zero is returned by default during normal code execution. System-critical errors (e.g., file not found) return non-zero exit codes. The developer is responsible for catching and handling program errors accordingly. At times a program may want to report a partial failure (e.g., batch process where X out of Y updates completed). In cases of partial failure, the system administrator can retrieve the log file for that job execution and view more detailed output from the program run. Success Exit code 0 - Process completed successfully. Partial Failure Exit code 3 - Process had a partial failure. Failure Any value not 0 or 3 (typically Exit code 1) - Process failed. Exit codes provide a mechanism to report status at a high level. For more granular control of the exit message displayed to the user, the app can write a message to the tc_out_path directory under the file named message.tc. All content in this file should be limited to 255 characters or less. The job executor reads this file after execution completes on each job and displays the contents in the Job table detail tip. The Reader package is the primary package to retrieve data from the ThreatConnect API. It covers all available resources exposed through the ThreatConnect API. The primary classes in the Reader Package, which encompass all read functionality from the API, are listed below. ReaderAdapterFactory Primary entry point to instantiate all readers in the Reader Package. AbstractGroupReaderAdapter<T extends Group> Generic Group Reader Abstract class. Concrete object available in ReaderAdapterFactory. AbstractIndicatorReaderAdapter<T extends Indicator> Generic Indicator Reader Abstract class. Concrete object available in ReaderAdapterFactory. AbstractReaderAdapter Base Abstract Reader for all Reader Adapters in the Reader Package. OwnerReaderAdapter Concrete Reader for Organization owner data. Convenience object available in ReaderAdapterFactory. SecurityLabelReaderAdapter Concrete Reader for SecurityLabel data. Convenience object available in ReaderAdapterFactory. TagReaderAdapter Concrete Reader for Tag data. Convenience object available in ReaderAdapterFactory. TaskReaderAdapter Concrete Reader for Task data. Convenience object available in ReaderAdapterFactory. VictimReaderAdapter Concrete Reader for Victim data. Convenience object available in ReaderAdapterFactory. There are more concise ways of handling reading data and purely checking its ID. This code is written in a more verbose form strictly to illustrate the usage of different methods in the ReaderFactory. 5-10 Notice how all Group-level entities in the imports are added. Results from reader Adapters will return an entity or a collection of entities from the com.threatconnect.sdk.server.entity package. 52-53 Groups to which the current API user has access under the “System” Organization should be retrieved. All AbstractGroupReaderAdapter’s have access to the getAllGroups() method—it returns a collection of Group objects for the “System” Organization from the ThreatConnect API. 60 To illustrate the different instantiations, a switch statement on the generic Group object is used. 61-63 Based on the Group.Type enum value (in this section, “Adversary”), an AdversaryGroupReader object is created from the ReaderAdapterFactory. The assignment to the adversaryReader variable is typed using generics to enforce compile time checks on the data returned from this reader. 65 The getById() method to retrieve the proper Adversary Group data, based on the ID and Organization name, from the ThreatConnect API, is used here. The result variable is assigned an Adversary-type object. 67-90 The remaining case statement blocks will check for different Group types, but, effectively, does the same operation. Take some time to review these blocks to understand how the ReaderFactory facilitates the creation of proper readers. 96 Here the Group ID is compared against the result ID returned by the getById method to assert that they are, in fact, the same entity. In the previous example, the IterableResponse class retrieves all Groups for the default owner. The IterableResponse class is the primary type returned by all collection-based reader operations. Typically, a collection, like a List, would be expected in this scenario, but to resolve the paging limits of the ThreatConnect API, the IterableResponse was created. All paging is performed behind the scenes, allowing the developer to rely on an Iterable to fulfill its contract and return a hasNext() of false when there are no more results. The Iterable will make use of the resultLimit value defined during the creation of the Configuration object. While the main entry point to the Reader Package is the ReaderFactory, getting familiar with the main Adapters helps developers understand how to interact with the data returning from the ThreatConnect API. Although there is extensive use of Java Generics, the method-naming conventions will be familiar and self-explanatory. Parameter naming conventions have been kept abstract to more accurately reflect the identifiers being passed. uniqueId Identifier for the reader/writer Group or Incident Adapter type. For Groups, this is an Integer that requires an Adversary ID, Email ID, Incident ID, Signature ID, or Threat ID. This identifier is system generated when the group is created in ThreatConnect. For Indicators, this is a String that requires an IP Address, Email Address, File Hash, Host Name, or URL text. This identifier is user generated when the Indicator is created in ThreatConnect. victimId Identifier for the Victim Adapter type. This identifier is an Integer created by the system when the Victim entry is created in ThreatConnect. assetId Identifier for the VictimAsset Adapter type. This identifier is an Integer created by the system when the VictimAsset is created in ThreatConnect. This identifier represents a VictimEmailAddress ID, VictimNetworkAccount ID, VictimPhone ID, VictimSocialNetwork ID, or VictimWebsite ID. securityLabel Identifier for SecurityLabel Adapter type. This is a user-provided String that represents the Security Label. tagName Identifier for Iag Adapter type. This is a user-provided String that represents the Tag. The AbstractGroupReaderAdapter is the object returned when GroupReader is called from the ReaderFactory. These GroupReader instantiations were reviewed in the last example. The Java SDK library for ThreatConnect comes with JavaDocs in the “apidocs” directory, which is an additional reference to the Java SDK. ApiFilterTypeexposes a builder pattern that can be used to build filters for indicators, groups, documents, tags, and victims. Filters can be passed to the getForFilters(...) method in the AbstractBaseReader class. The methods below get data for the Group type (T) linked to this Adapter. The uniqueId (P) for Groups is an Integer. The methods below get generic Group objects associated to this Group type (T). The methods below get associated Group elements by distinct type. The methods below get associated Indicator elements by distinct types. The methods below get associated SecurityLabel data elements. The methods below get associated Tag data elements. The methods below get associated VictimAsset data elements. The methods below get Attributes and Attribute SecurityLabels for this Group type. AbstractIndicatorReaderAdapter and AbstractGroupReaderAdapter share many of the association actions. Indicators share the ability to associate Groups, Indicators, SecurityLabels, Tags, VictimAssets, and Attributes. The listings below are some distinctions or subtle differences. All Indicators in the ThreatConnect API have a uniqueId data type of “String”. This identifier is provided by each Organization in the form of an Email Address, IP Address, File Hash, Host Name, or URL text. To understand this distinction, read the Indicator section in the ThreatConnect API documentation. The methods below get data for the Indicator type (T) linked to this Adapter. The uniqueId (P) for Indicators is a String. The method below returns all the generic Indicators to which the current API user has access. The methods below return owners who have created the Indicator under the uniqueId. The methods below return False Positive counts for the Indicator under the uniqueId. The methods below return Observations and Observation counts for the Indicator under the uniqueId. The AbstractIndicatorReaderAdapter class has a concrete subclass FileIndicatorReaderAdapter that exposes the methods below. The BatchReaderAdapter class allows the developer to poll for the status of a batch upload file using a batch id. Once a batch is complete (either successfully or with errors), the developer can download errors (if any). The DocumentReaderAdapter class is a subclass of the AbstractGroupReader class. In addition to all GroupReader functionality, the document reader has access to the following method. The OwnerReaderAdapter is a simple Adapter that returns a list of Organizations to which the API user has access. There is a second method called “getOwnerMine()” that returns the default Organization for the API user. The SecurityLabelReaderAdapter class is a concrete class (available through the ReaderFactory) that returns SecurityLabels to which the developer’s API user has access, as well as by uniqueId (P). The uniqueId data type for SecurityLabels is a String. In addition to retrieving basic SecurityLabel data, associated Groups and Indicators can be retrieved. For more details on these methods, see the AbstractGroupReaderAdapter class. The TagReaderAdapter class is a concrete class (available through the ReaderFactory) that returns Tags to which the developer’s API user has access, as well as by uniqueId (P). The uniqueId data type for Tags is a String. In addition to retrieving basic Tag data, associated Groups and Indicators can be retrieved. For more details on these methods, review the AbstractGroupReaderAdapter class. The TaskReaderAdapter class is a concrete class (available through the ReaderFactory) that returns Tasks to which the API user has access, as well as by uniqueId (P). The uniqueId data type for a Task is an Integer. In addition to retrieving basic Task data, associated Assignees and Escalatees can be retrieved. The VictimReaderAdapter class is a concrete class (available through the ReaderFactory) that returns Victims to which the API user has access, as well as by uniqueId (P). The uniqueId data type for a Victim is an Integer. In addition to retrieving basic Victim data, associated Groups, Indicators, and VictimAssets can be retrieved. For more details on these methods, review the AbstractGroupReaderAdapter class. 3-4 An IndicatorReaderAdapter is created to read all the addresses to which the API user has access. The getAll() method returns a collection of addresses from the ThreatConnect API. 5-6 Each address is iterated through and its uniqueId is printed. As mentioned in the AbstractIndicatorReaderAdapter section, all uniqueIds for Indicators are Strings. In the case of address objects, it is the IP address or the getIp() getter method. 8 To get a collection of associated Tags for the IP Address, the getAssociatedTags() method is called. 10-11 Each Tag returned from the ThreatConnect API for that specific IP address is iterated through and printed to the console. The Writer Package shares many of the concepts of the Reader Package with the distinction of introducing the new functionality of version 2.0 of the ThreatConnect API. Note that the WriterAdapterFactory class is effectively the “hub” for writer Adapters. It provides convenience objects for all the Adapters in the Writer Package. Below is a list of the static methods and return types of the WriterAdapterFactory. WriterA dapterFac tory Primary entry point to instantiate all writers in the Writer Package. Abstrac tGroupWri terAdapte r<T exten ds Group> Generic Group writer abstract class. Concrete object available in WriterAdapterFactory. Abstrac tIndicato rWriterAd apter<T e xtends In dicator> Generic Indicator writer abstract class. Concrete object available in WriterAdapterFactory. Abstrac tWriterAd apter Base abstract writer for all reader Adapters in the Reader Package. Securit yLabelWri terAdapte r Concrete writer for SecurityLabel data. Convenience object available in WriterAdapterFactory. TagWrit erAdapter Concrete writer for Tag data. Convenience object available in WriterAdapterFactory. TaskWri terAdapte r Concrete writer for Task data. Convenience object available in WriterAdapterFactory. VictimW riterAdap ter Concrete writer for Victim data. Convenience object available in WriterAdapterFactory. Abstrac tBatchWri terAdapte r<T> Writer for batch indicator uploads. Concrete object available in WriterAdapterFactory. The primary methods for the WriterFactory are listed below. They encompass all write functionality for the ThreatConnect API. This section details some conventions used in the writer API that will help clarify how deletes, creates, and updates are handled by the Java SDK, and what the developer should expect when a failure occurs. When a single item is modified (create/delete/update) using the Java SDK, the return type is an ApiEntitySingleResponse object. In an effort to simplify write-operation response handling, the ApiEntitySingleResponse object provides a single object for the developer to validate the modify operation. When a collection of items is modified (create/delete/update) using the Java SDK, the return type is a WriteListResponse object. Likewise, in an effort to simplify write-operation response handling, the WriteListResponse object holds collections of failed/succeeded ApiEntitySingleResponse objects. The following listing describes how modify responses should be handled. While the ApiEntitySingleResponse class manages failed write operations to the ThreatConnect API, the developer is responsible for capturing any runtime exceptions that may occur because of network, configuration, or data-related issues. There are entity classes available using a fluent style to simplify object creation. These classes are part of the SDK and can be used in place of creating a traditional new ThreatConnect entity with all setters. Using the fluent entities in the com.threatconnect.sdk.client.fluent package are optional and a matter of preference. 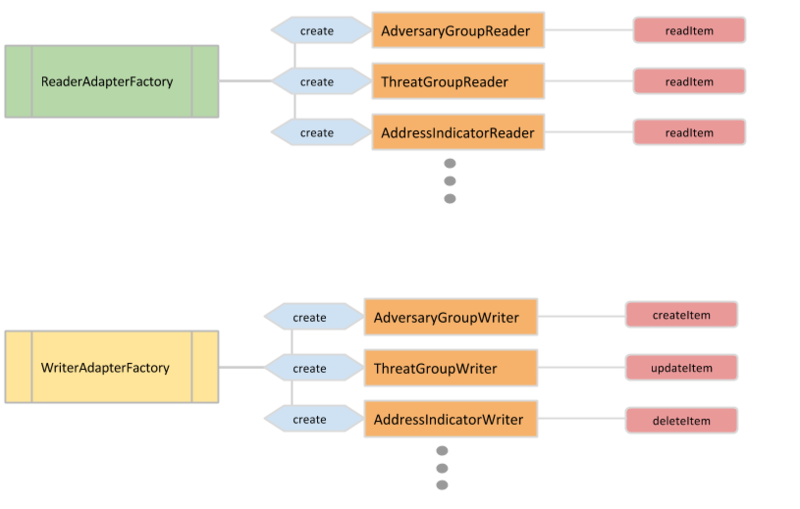 104 An AbstractGroupWriterAdapter for the Adversary Group type is created. With this Adapter, Group data elements, Victim assets, Attributes, and associations can be written/updated/deleted. 106-10 8 A simple Adversary with a name and owner (Organization) is created. 111 The writer is used to create an Adversary using the ThreatConnect API. For single-item writes, an ApiEntitySingleResponse object is always returned. This object allows for the appropriate inspection and handling of the response. 112-11 4 To see if the create was successful, isSuccess() is called. If the check passes, the item associated with the response is delivered using the getItem() method (Line 113). The successfully saved Adversary object returns from the ThreatConnect API with a valid ID value. 116 If the response is unsuccessful, the response message to the console is printed. 121 Any potential runtime exceptions are caught and handled appropriately. In the case of this basic example, it is simply dumped to the console. Most of the conventions in the Reader Package are mirrored in the Writer Package. Much like the Reader Package, the method-naming conventions will be familiar and self-explanatory. Parameter-naming conventions have been kept abstract to allow for a better representation of the identifiers being passed. Below is a listing of the classes in the Writer Package. The methods below write data for the Group type (T) linked to this Adapter. The create methods require a Group type object as a collection or single object. The delete methods require the key ID value as a collection or single object. The update methods require a Group type object as a collection or single object. The methods below associate a Group type to another Group type. Groups are associated by passing in the uniqueId (Integer) with the Group ID to which it will be associated. The methods below associate Indicators to a Group type. The methods below associate Security Labels to a Group type. The methods below associate Tags to a Group type. The methods below associate Victims to a Group type. The methods below associate Victim Assets to a Group type. The methods below add Attribute types to a Group. The methods below update an Attribute added to a specific Indicator type. The methods below create an Observation on a specific Indicator type. The methods below update the False Positive field on a specific Indicator type. The methods below delete Group associations to a specific Group type. The methods below delete Indicator associations to a specific Group type. The methods below delete SecurityLabel associations to a specific Group type. The methods below delete Tag associations to a specific Group type. The methods below delete Victim associations to a specific Group type. The methods below delete VictimAsset associations to a specific Group type. The methods below delete Attributes from a specific Group type. These interfaces allow the AbstractIndicatorWriterAdapter to run all of the same methods as the AbstractGroupWriterAdapter. The key parameter-level distinction between the AbstractIndicatorWriterAdapter and the AbstractGroupWriterAdapter is the type (T) for the uniqueId parameter. As mentioned in previous sections, Indicator uniqueId types are all Strings. The method-naming conventions are the same. Once a batch configuration is created, the ApiEntitySingleResponse object returns BatchResponseData with a batchId if successful. This batchId is used to upload the batch file using the uploadFile method. At this point, a successfully response to the upload will trigger the batch. Use the BatchReaderAdapter to poll for the status of the batch. The SecurityLabelWriterAdapter class allows Group and Indicator associations. Much like the Indicator Adapters, the uniqueId is a user-created Security Label String. In addition to creating associations, the SecurityLabelWriterAdapter allows deleting associations from Group and Indicator types. Below is the standard create methods available to all WriterAdapter’s. Note that the deletes require the Security Label as the uniqueId String (P). The create and update requires the full SecurityLabel object (T). The TagWriterAdapter class allows Group and Indicator associations. Much like the Indicator Adapters, the uniqueId is a user-created Tag name String. In addition to creating associations, the TagWriterAdapter allows deleting associations from Group and Indicator types. Below is the standard create methods available to all WriterAdapters. Note that the deletes require the Tag Name as the uniqueId String (P). The create and update requires the full Tag object (T). Below is the standard create methods available to all WriterAdapters. In addition to the User-specific methods below. Note the delete methods require the username while the create methods require the entire User object. The TagWriterAdapter class allows Group, Indicator, and VictimAsset associations. Much like the Group Adapters, the uniqueId is a user-created Security Label String. In addition to creating associations, the VictimAssetWriterAdapter can remove associations for Group, Indicator, and VictimAssets. Below is the standard create methods available to all WriterAdapters. Note that the deletes require the system-generated VictimAsset ID as the uniqueId Integer (P). The create and update requires the full VictimAsset object (T). This section offers examples on how to create, delete, and update data using the Java SDK for ThreatConnect. 131 Since Adversary objects from the ThreatConnect API will be created and deleted, an AbstractGroupWriterAdapter with the Adversary parameterized type applied is instantiated. 138-139 An Adversary object with the ThreatConnect API is created, the response is captured, and isSuccess() is called to check if the save was successful. 140 The response Adversary object returned from the ThreatConnect API is printed. The getItem()method will return this object with the ID field populated. This method will always hold the saved item on a successful response. 141-142 The ID from the successful create is used to delete the same Adversary object. Note that the call to the delete() method requires the system-generated Adversary ID. 143-144 The delete response is verified as successful, and the original response is dumped. 146 With a failed delete, the error message is printed by calling the getMessage() method on the response object. 149 If the original create failed, the getMessage() method is also called to find the cause. 155-164 A test Adversary is created and saved to the ThreatConnect API. 166-168 The created Adversary is assigned to a variable called “updatedAdversary()” so that the Adversary name can be changed (line 167). Before updating the Adversary in ThreatConnect, it is printed to the console. The output should have an ID value populated and the name should read: “UPDATED: Test Adversary”. 170-172 The “update()” method is called to save the changes to ThreatConnect. The argument to this method is the actual Adversary object. Just like the delete, the response success is verified and written to the console. 72-73 The test email object and the Attribute to be added are created. 79-81 The email in ThreatConnect is created and checked that it is successful. 86-87 The addAttribute() method takes the Email Group ID and the Attribute object to be added. 89-90 To confirm that the Attribute was added successfully, the response is checked. 106-107 Two writers are created: one for the new email and the other for the host to be associated. 109-110 The test email object is crated, as well as the host to be associated. 117-121 To set up the example, both email and host are created in ThreatConnect. The create is verified as successful and the items are printed to the console. 126-128 The host is associated to the Email Group by using the Email ID and the Host Name (the unique ID for the Host Indicator). 130-133 The association is verified as successful. 153-154 Two writers are created: one for the new email and the other for the Threat to be associated. 156-157 The test email object is created, as well as the Threat to be associated. 163-167 To set up the example, both email and Threat are created in ThreatConnect, the create is verified as successful, and the items are printed to the console. 172-174 The Threat is associated to the Email Group by using the Email ID and the Threat ID. 176-179 The association is verified as successful. 198-199 Two writers are created: one for the new email and the other for the Tag to associate. 201-202 The test email object, and the Tag to associate, are created. 208-214 To set up the example, both email and Tag are created in ThreatConnect. The create is verified as successful, and the items are printed to the console. 219-221 The Tag is associated to the Email Group by using the Email ID and the Tag name (the uniqueID for the Tag). 223-226 The association is verified as successful. 305-306 Two writers are created: one for the new email and the other for the Victim to associate. 308-309 The test email object, and the Victim to associate, are created. 315-319 To set up the example, both email and Victim are created in ThreatConnect. The create is verified as successful, and the items are printed to the console. 324-326 The Victim is associated to the Email Group by using the Email ID and the Victim ID. 328-331 The association is verified as successful. 245-271 The Email Group is created and associated with the Tag item. 276-278 The dissociateTag() method is called using the same parameters as the associate method. The email item ID value is used with the Tag name. 280-281 The deleting is verified as successful, and the message is dumped to the console.